1. Need to get the phone to charge faster? Turn Airplane Mode ON. 2. Use your Headphones volume controls as a cable shutter release. No more touching your iPhone and creating camera shake! 3. Ah this is one I need badly! 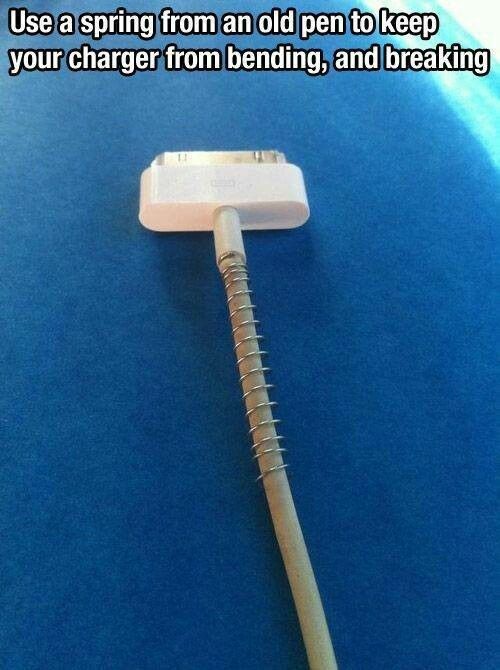 Use a spring from an old pen to keep your charger from breaking! 4 – 5. 2 different ways to kid-proof your iPhone. I never knew about these lock down features, did you? 6. Have a phone full of thousands of photos like me? 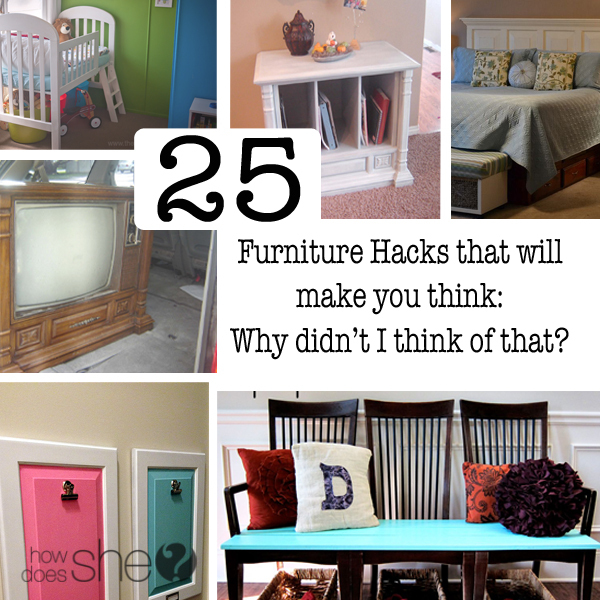 Here’s some great ways how to back them up! 7. Do you lose your phone all the time like I do? Here’s how to find your iPhone even when it’s on silent! 8 – 12. Great tips for using your Smartphone Camera. You have a camera, now use it to take amazing pictures! 13 -17. Need to be better organized? 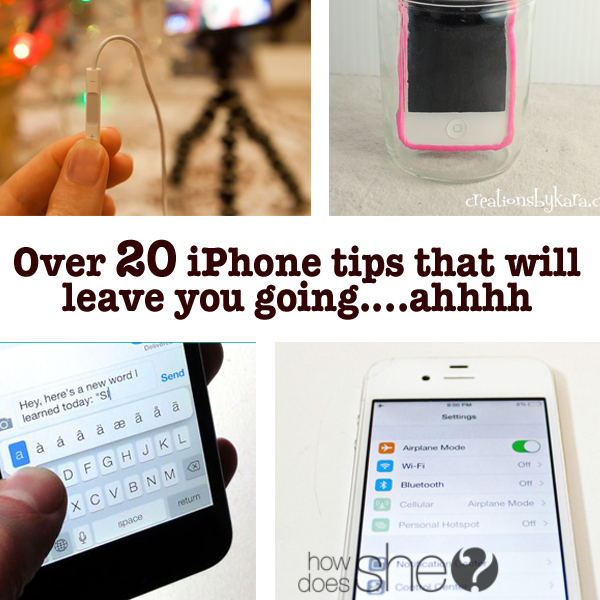 Start with these iPhone tips! 18 – 25. 8 Typing Tips you need to know. So simple yet so helpful! Bonus- here’s a great way to amplify your sound. Have you seen this yet? Now I’m off to find an old pen and see if I can’t fix some of these cords around here! Oh yea, and to kid proof my phone. ASAP! « Perfect Gift Idea. Drops of Awesome! Such great tips! I actually just used that sound amplifier tip recently when I was a bridesmaid in a wedding and we wanted to rock out to some music as we were getting dressed but didn’t have any speakers…problem solved! Am I missing something? How do you get the spring from the pen onto that cord? i was wondering the exact same thing Crystal! Just unwind the spring a bit then wind it back onto the cord. Make sense? Great site with helpful info. I liked the phone hacks because I was dragged kicking and screaming into the 20th (yes, I said 20th) century and now have a simple android phone. Some of the iPhone hacks can be applied to my regular android and other hints caused me to check around to see if my phone did it in a different way. I’m sure I’m going to love this site. My husband and son can do just about anything on their phones. I can say “hello”. That’s about it. I love the tips. Thank you for explaining the spring cable cord protector. I have trouble starting the connection. Any hints? Help! I have so many previous videos on my iPhone.. Besides dumping them on the computer is there another way to save these videos so I can free up space on my iphone6? Ideally, I want to get them in a DVD so I can bing them to my grandparents to show them on their player. Please help. Talk about iPhone tips!! I tried to view your site on my iPhone but there were so many pop-ups that the site kept reloading and I had to quit! I went to my computer because I wanted to see the tips, but also because I wanted to complain (sorry) about the absurd amount of real estate you’ve given up to ads. I know you need/want to make money but it’s not worth visiting or bookmarking a site if I constantly have to click to X out.